ESA's Herschel Space Observatory has detected massive amounts of molecular gas gusting at high velocities - in some cases in excess of 1000 kilometres per second - from the centres of a set of merging galaxies. Driven by star formation and central black holes, these powerful storms are strong enough to sweep away billions of solar masses of molecular gas and to interfere with global galactic processes. These observations indicate that, in the galaxies hosting the brightest Active Galactic Nuclei, outflows can clear the entire supply for creating stars and feeding the black hole. This finding provides long-sought-after evidence of highly energetic feedback processes taking place in galaxies as they evolve. 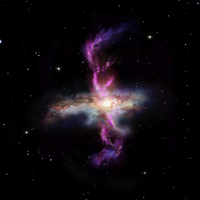 Artist's impression of an Ultra-Luminous InfraRed Galaxy (ULIRG) with outflows of molecular gas. Massive outflows of gas from galactic centres are tell-tale signs that powerful, storm-like processes affecting the global galactic balance of mass and energy are underway. Within a galaxy, these storms can be generated in the regions of active star formation, stirred by stellar winds and shock waves from supernova explosions. They can also be triggered close to the central black hole, where radiation pressure from the accretion disc drives the surrounding gas away. When powerful enough, outflows can sweep away the galaxy's entire reservoir of gas, depleting it of the raw material that creates stars and feeds the central black hole. This inhibits further star formation episodes and additional black hole growth. Thus, galactic outflows cause negative feedback, halting the same mechanisms that produced them in the first place. "Outflows are key features in models of galactic formation and evolution, but prior to our work no decisive evidence of their active role in such processes had been gathered," explains Eckhard Sturm from the Max-Planck-Institut für extraterrestrische Physik (MPE) in Germany. Sturm led a study that revealed massive outflows of molecular gas in a set of infrared-luminous galaxies observed with Herschel. While there have been other detections of galactic outflows, almost all previous observations dealt only with neutral and ionised gas. "By detecting outflows in the cold molecular gas from which stars are born, we can finally witness their direct impact on star formation," he adds. The team observed a number of Ultra-Luminous InfraRed Galaxies (ULIRGs): galaxies enshrouded in gas and dust that shine brightly in the infrared. They were observed with the spectrometer of Herschel's PACS instrument as part of the Survey with Herschel of the ISM in Nearby INfrared Galaxies (SHINING), a guaranteed-time key programme of the PACS consortium. Elliptical galaxies are thought to arise from the merger of gas-rich spiral galaxies, a process in which ULIRGs represent an intermediate stage. Gas outflows develop naturally within this scenario, and they are crucial to explaining some observed characteristics of elliptical galaxies. Elliptical galaxies contain old stellar populations, relatively small amounts of gas and almost no sign of ongoing star formation. This is in contrast with spiral galaxies, which are dominated by young stars and are rich in gas necessary for intense star formation. For elliptical galaxies to derive from spiral galaxies, something must drain the cold gas and halt the production of stars, and outflows such as those observed by Herschel appear as ideal candidates for the job. Another property that finds a natural explanation in galactic outflows is the strong correlation observed between the mass of black holes and the stellar mass of the spheroidal component of the galaxies hosting them: black holes that are relatively more massive appear to reside in galaxies with spheroids that contain more stars. This empirical relation suggests that black hole growth and star formation are intertwined, both initially drawing from the gas reservoir, and creating feedback mechanisms such as outflows that eventually suppress them. "Herschel's sensitivity enabled us to detect these gigantic galactic storms, and to demonstrate, for the first time, that they may be strong enough to shut down stellar production entirely," says co-author Albrecht Poglitsch, also from MPE and the Principal Investigator of PACS. The outflows were traced via spectral lines of the hydroxyl molecule (OH). The excellent spectral resolution of PACS allowed astronomers to clearly identify the characteristic blue- and red-shifted profile caused by the system geometry. "With velocities of 1000 kilometres per second and higher, the outflows we detected are 10,000 times faster than any terrestrial hurricane and are able to strip galaxies of gas amounting to several hundred solar masses every year," he adds. 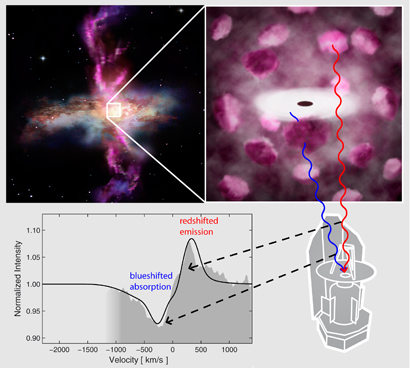 The data set suggests that slower outflows may be initiated by star formation regions, whereas those with higher velocity appear to be related to the activity of Active Galactic Nuclei (AGN) powered by central black holes: brighter AGN seem to sweep gas away faster than their less luminous counterparts. However, it will be necessary to analyse a larger sample of galaxies in order to verify this claim that the measured velocity can be used as an indicator of the main mechanism driving the outflow. "Although it is early to draw general conclusions, it appears that the galaxies hosting the most luminous AGN are releasing gas at a much higher pace than their star formation rates. We expect that they will exhaust their reservoir of cold molecular gas rather quickly," notes team member Jacqueline Fischer from the Naval Research Laboratory in the USA. In the next few million years to a few hundred million years, both star formation and black hole growth will cease in these objects. This will produce galaxies with characteristics that match those observed in ellipticals: poor in cold gas, populated by old stars and harbouring black holes with masses strongly correlated with the galaxy’s stellar mass. "By catching molecular outflows 'in the act', Herschel has finally yielded long-sought-after evidence that powerful processes with negative feedback do take place in galaxies and dramatically affect their evolution," adds Göran Pilbratt, ESA's Herschel Project Scientist. The findings presented here are based on spectra from a small subset of galaxies - six in total - obtained as part of the Survey with Herschel of the ISM in Nearby INfrared Galaxies (SHINING), a Herschel guaranteed-time key programme of the Photoconductor Array Camera and Spectrometer (PACS) instrument consortium. The aim of the programme is to observe more than 50 galaxies in order to study star formation and activity in infrared-luminous galaxies at local and intermediate redshifts. This early subset of galaxies that has been analysed by Sturm and colleagues cover a range of starburst and AGN activity, ranging from a starburst template (NGC 253) and a starburst-dominated ULIRG (IRAS 17208-0014) to AGN-dominated ULIRGs with various values of AGN luminosities (Mrk 231, IRAS 08572+3915, IRAS 13120-5453, IRAS 14378-3651). The outflows in these galaxies are traced by the hydroxyl molecule (OH) transition line at 79 μm. At this wavelength the spectral resolution of PACS is about 140 kilometres per second. In addition, other OH transition lines have been detected, at 65 μm and 119 μm. PACS is especially suited to studying ULIRGs: in contrast to observations made in visible light, the far-infrared wavelength range probed by PACS is much less affected by obscuration effects due to gas and dust in the centres of Ultra-Luminous InfraRed Galaxies (ULIRGs). The far-infrared is also the wavelength range where ULIRGs emit most of their light. Herschel is an ESA space observatory with science instruments provided by European-led Principal Investigator consortia and with important participation from NASA. The PACS instrument contains an imaging photometer (camera) and an imaging spectrometer. The spectrometer operates in the wavelength range 55 to 210 μm over a field of view of 47×47 arc seconds, resolved into 5×5 pixels, each with 16 spectral elements. Sturm, E., et al., "Massive molecular outflows and negative feedback in ULIRGs observed by Herschel-PACS", ApJL, 733, L16 (2011). Fischer, J., et al., "Herschel-PACS spectroscopic diagnostics of local ULIRGs: Conditions and kinematics in Markarian 231", A&A, 518, L41 (2010).